The taupe-colored colonial farmhouse at 109 Greens Farms Road is located near many town amenities including Compo Beach and two train stations. WESTPORT — Back in 1860 much of Westport, and neighboring Fairfield, was agricultural and many of its farms grew onions. “The most prosperous years for onion farming in Westport lasted from around 1860 until 1885,” according to author and historian Gregg Mangan in an article on the connecticuthistory.org website. With that timeline it is likely that the colonial farmhouse at 109 Greens Farms Road sat on an onion farm. The taupe-colored house with off-white trim was built in 1860. It sits on a largely level property of almost one acre in the Greens Farms neighborhood. “By the end of the century, however, the rising costs of fertilizers and competition from larger farming enterprises largely brought an end to the commercial (onion) industry in Westport … After the decline of the industry, wealthy urbanites slowly developed the farmland for summer homes and permanent housing away from the noise and pollution of the city. This transition from farm land to residential suburb helped mold much of the town’s character into what it is today,” Mangan said in his article titled The Many Layers to Onion Farming in Westport. The town’s character today is that of a tony coastal community with a wealth of activities, and this house is central to all of them. Its location puts it within easy access of town amenities. It is only a short bicycling distance to Compo Beach, Ned Dimes Marina, and the Longshore Club Park for golfing, tennis, ice skating, sailing, swimming, boating, and other recreational activities. It is a short car ride to the center of town including the public library, Levitt Pavilion, Westport Country Playhouse, shopping, and restaurants. 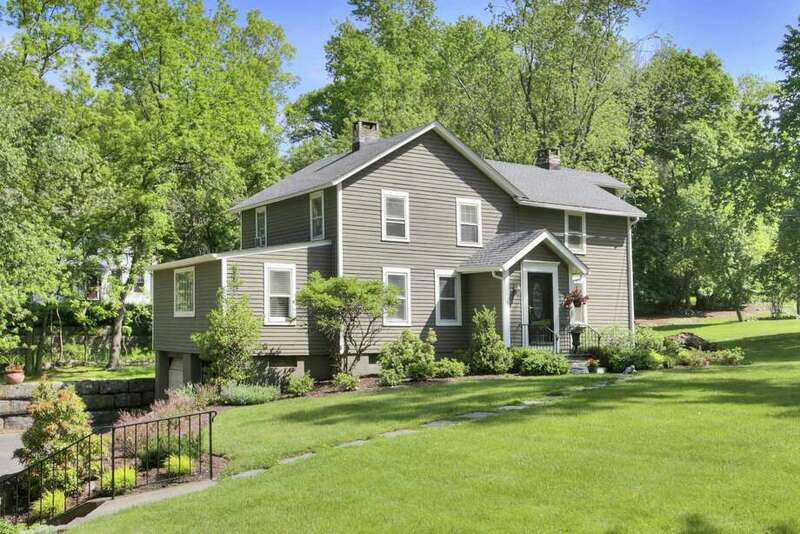 For the convenience of commuters it also is located equidistant from the Greens Farms and Saugatuck Metro North train stations - both of which are just under two miles away, and it is not far to the entrance to I-95 via the connector. Downtown Westport is only two miles away; about a seven-minute car ride. Enter the property by way of the ample unpaved driveway, which leads to the attached, under house two-car garage. Climb the concrete stairs with a wrought iron railing passed flower gardens and the front lawn to the front door containing an oval window with decorative leaded glass. It is framed in flush, fluted columns and dentil molding. Inside, the house has eight rooms and 2,265 square feet of living space. The first floor has an open floor plan. The formal living room and family room share a double-sided, weeping mortar brick fireplace. Off both rooms there is a study or office with wall-to-wall carpeting. From the family room there are French doors into a sizable screened porch with a ceiling fan. The porch provides access to a large wrap-around wood deck. In the formal dining room there is chair railing and a built-in corner china cabinet. The updated kitchen is open to the dining room and features granite counters, a built-in desk area, stainless appliances, and a large rectangular picture window looking over the back yard. Rounding out the first floor are the mudroom, powder room, and laundry room. There is also a door in the laundry room to the side of the deck. On the second floor there are three bedrooms. The spacious master suite features a nine-foot ceiling with exposed beams, a ceiling fan, and an updated bath. The remaining bedrooms share a hall bath. The full, unfinished basement has another 1,164 square feet that can be converted into living space including a play or game room.